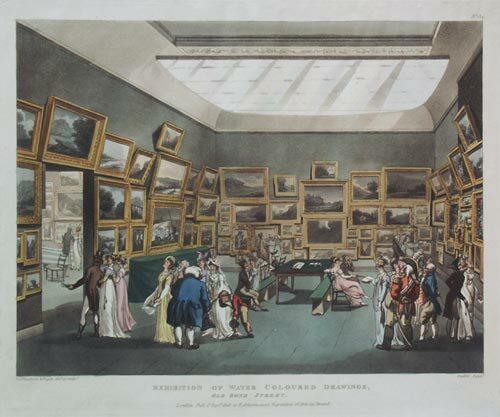 An aquatint, in fine original colour, depicting the Exhibition Room at Somerset House. The plate was drawn and etched by the caricaturist, Thomas Rowlandson and the famous architect, Charles Augustus Pugin then aquatinted by Stadler. Rowlandson produced the figures in his inimitable style and Pugin provided the architectural backdrop. The plate was issued as part of the Microcosm of London, an ambitious work published by Ackermann at his Repository of Arts, London, 1808.